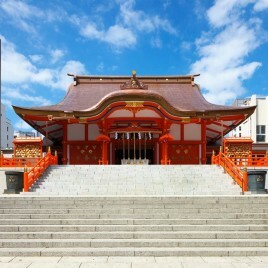 Hanazono Shrine in Shinjuku, Tokyo, is decorated with good luck charms such as the kazari kumade (decorative rake) – a custom passed down since the Edo Period – to wish its visitors good luck and business fortune for the Tori No Ichi event every November. You will find a sea of people lining up in front of stalls by the shrine to purchase a kazari kumade and other festivity-filled goods. 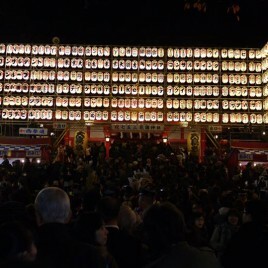 It is especially beautiful at night, as the whole shrine is lit up with lanterns.